In 2005, the U.S. 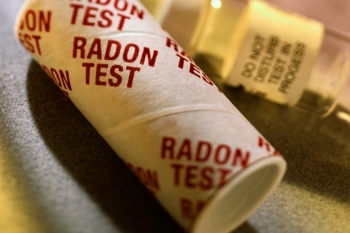 Surgeon General issued a Health Advisory urging Americans to test their homes for radon. But what exactly is radon, and is it really worth it to get your home tested? As a franchise owner for the most trusted home inspection company in North America, my answer is a resounding yes! Radon is a radioactive gas that is created by uranium as it naturally breaks down in soil, rock, and water. This gas spreads to the air you breathe, and since it is colorless and odorless, you won’t know you’re breathing it in. Prolonged exposure to radon can have devastating results. The EPA reports that radon is the number one cause of lung cancer in non-smokers. So how can you protect yourself from radon and all its risks? Luckily, we have the answers. By ensuring that your future home is tested for high radon levels, you can prevent yourself and your family from being exposed while inside your home. If you are already residing in a home that hasn’t been tested we recommend that you test as soon as possible so you can begin radon mitigation, if needed. Once your home is tested, a mitigation contractor will be able to tell you if radon gas is present. If high levels are found in your home and you or a family member have experienced symptoms such as persistent chest pain, difficulty breathing, or frequent chest infections, it is important to see a physician. How Likely is it That Radon is in My Home? Because of the surrounding environment, radon is frequently found in Colorado. In our state, approximately half the homes have radon levels higher than the EPA’s recommended action level of 4 picoCuries per liter (pCi/L). But radon is also common across the entire country. The National Radon Safety Board reports that about one out of every 15 homes in the U.S. have elevated radon levels. It’s also important to understand that radon is unique in its dispersal. For instance, the house next door to yours could be fine while your home simultaneously has elevated radon levels. The safest way to know if you have high levels of radon in your home is to have it tested. How to Test Your Home for Radon. To safely test your home for radon, hire a professional home inspector, like a member of my team here at HouseMaster. We have the knowledge and equipment necessary to make sure the radon levels are correctly measured. After you schedule a test, an inspector will come to your home and set up a radon monitor. These monitors will be placed in various areas in the home starting with basement areas. Radon is a heavy gas that seeps in from the soil, so it tends to be more prevalent in lower levels. Each monitor will be placed in out of the way spaces where they won’t be disturbed for at least 48 hours. Ideally this test would be conducted several times during different seasons because radon levels go up and down based on pressure differentials in the atmosphere. After placing the monitors we’ll then schedule a time to come back and document the readings. If the monitors indicate radon levels at or above 4 pCi/L, it’s time to take action to reduce levels. What Do I Do if Radon is Found in My Home? If radon levels are high in your home, you can hire a qualified radon mitigation contractor to address your concerns. The National Environmental Health Association recommends consumers only use contractors who have undergone specific radon mitigation training and received certification, like those who participate in the National Radon Proficiency Program (NRPP). A radon mitigation contractor has several options to mitigate radon. Most commonly they will cut through the slab of your basement to create a small three-inch hole. They will then use PVC pipe to vent the area to the outside with a silent inline fan that will pump the radon to the exterior of the home where it can disseminate and cause no harm. It’s a simple fix, and you won’t even know it’s there. This process can usually be done in one day. Costs vary, but on average homeowners can expect to pay approximately $1000 for radon mitigation. And as we explained earlier, if you do show any symptoms of radon exposure you should see a physician. High radon levels are dangerous, but fortunately there is a solution to remove the radon risk in your home. Testing for radon is so easy and so worth it. My team and I are here to make the process as painless as possible. We want to help you keep your family healthy and happy. Click here to schedule your own home inspection and radon testing.